A welcoming opening hole. Play is over a small lake to a generous landing area. 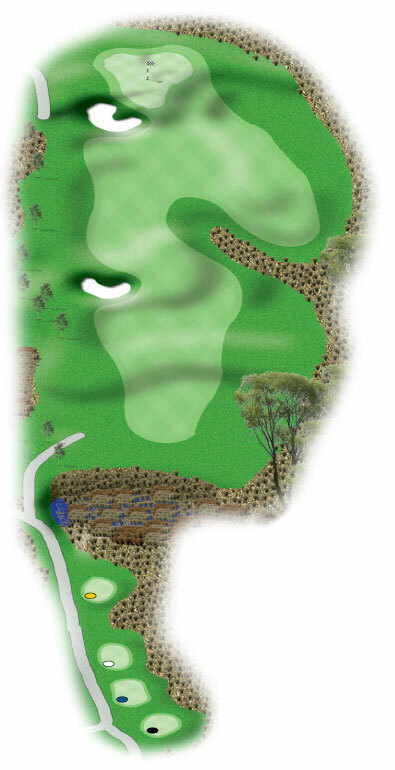 The large and gently contoured green is receptive, but the surrounding wetland will punish the most errant shots. 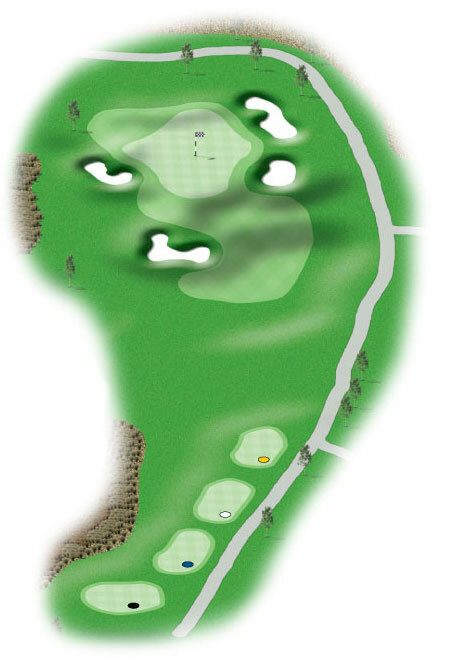 Be careful with club selection on this long par 3. 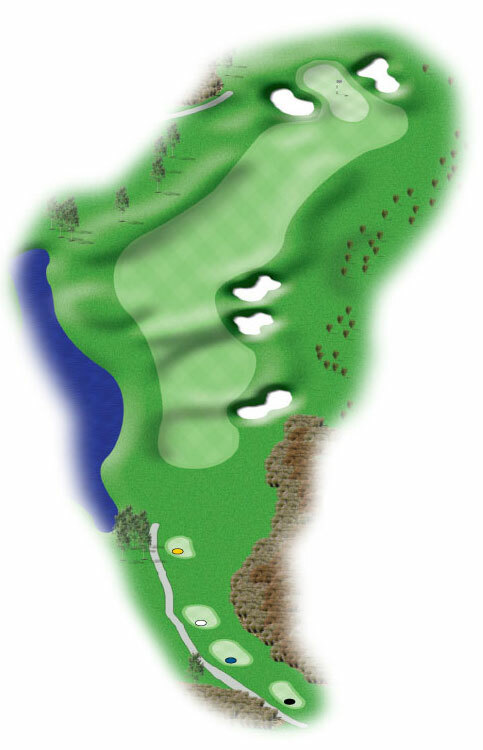 A tail wind assists, but holding the chip back will be tricky; short right and you could end up in a bunker. 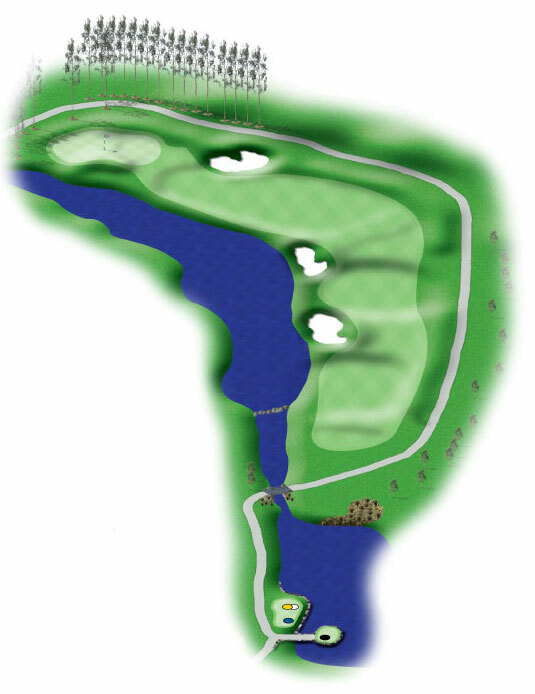 With a dogleg right, long hitters may be tempted to bite off the corner over the lake however the smart play will be to take a long iron and lay up before the target bunker at the turning point for the best line in to the green. Given the prevailing wind this could be a drivable par 4 for the big hitters. Be on target though, as the green is small and a nest of bunkers awaits a shot too short and right. Otherwise the approach is straightforward. Beyond the green the slope falls steeply to out-of-bounds. Bite off as much as you dare over three deep cross-fairway bunkers and be rewarded with greater visibility to the green and better line of approach from the right-hand-side of the hole. Take a longer club on your second for a chance to reach the green in two. Drive close to the right-hand bunkers from the tee off, for an open invitation to the left to right sloping green on your second. A long drive left and forgiving contours will feed your ball to the right. The ideal tee shot is to drive over the left hand bunker. With a left to right sloping fairway, a drive too far right could bring both the water and front greenside bunker into play. 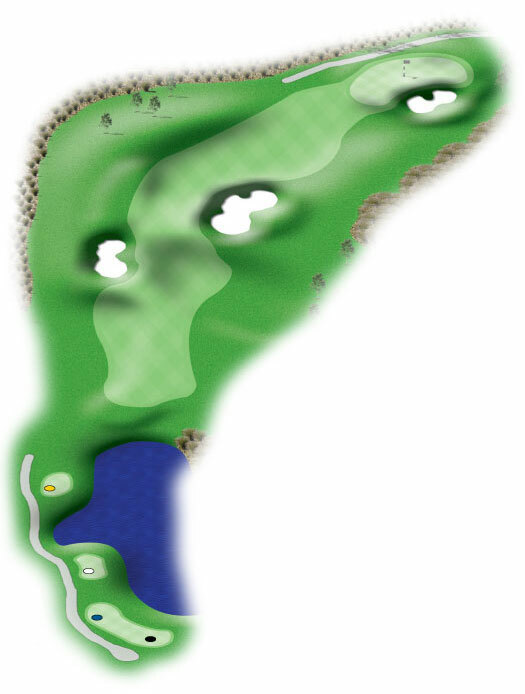 This delightful-looking par 3 could prove chaotic into the prevailing wind. The green is shallow but wide. Pin placement and wind strength will determine success on this hole. A good drive between fairway bunkers will allow a second shot over the low native plantings short of the green. A drive lacking length however will leave the decision to lay-up or go for it. This hole will play longer into the wind. 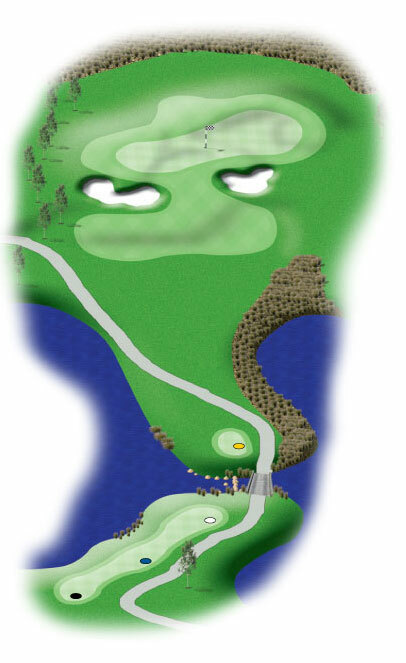 The island tee set in the lake will bring challenge to the tee shot. A classic risk/reward hole. 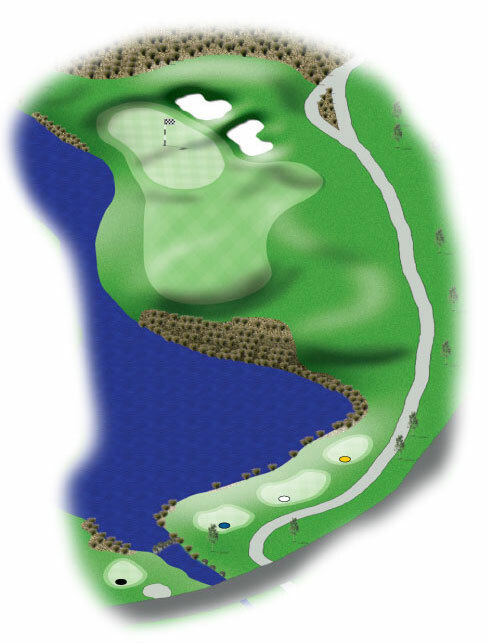 Carry the bunkers on the left-hand-side of the fairway and stick close to the lake for a short approach shot to a receptive green. Boasted by a small water carry and a gently contoured green, this par 3 is picture perfect. But with water to the left and two bumpers to the right, accuracy is encouraged. A long par 4. 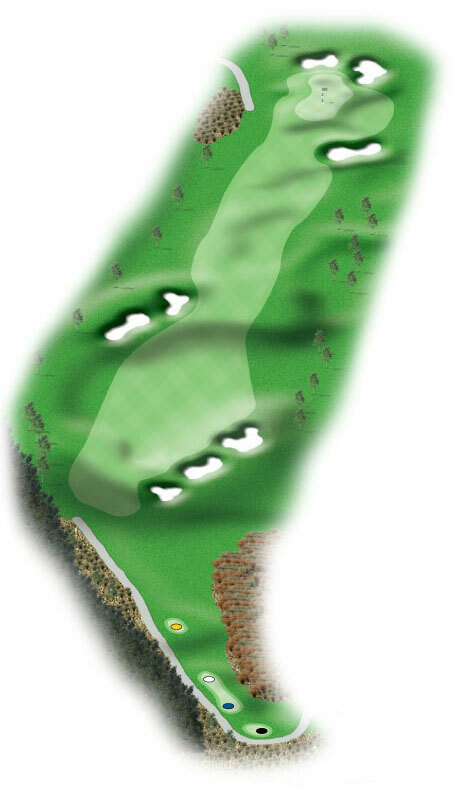 Bunkers left and right steer play to the centre of the fairway. Get as much length as you can for an uncomplicated approach to the heavily contoured tiered green. The openness of this hole encourages a long drive that will be rewarded with extra run in the landing area, leaving a short wedge into the green. Too long and the drive could end up with a tricky lie in the swale in front of the green. 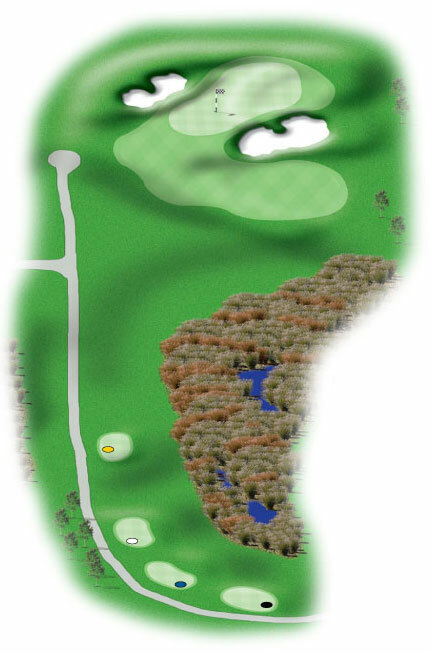 A medium length par 3 with a green guarded by bunkers. Players may be deceived by the bunker in front of the green and play one club short. A deep vegetated gully splits the fairway. Drive across the wetland for an accommodating angle into the length of the right-to-left sloping green. 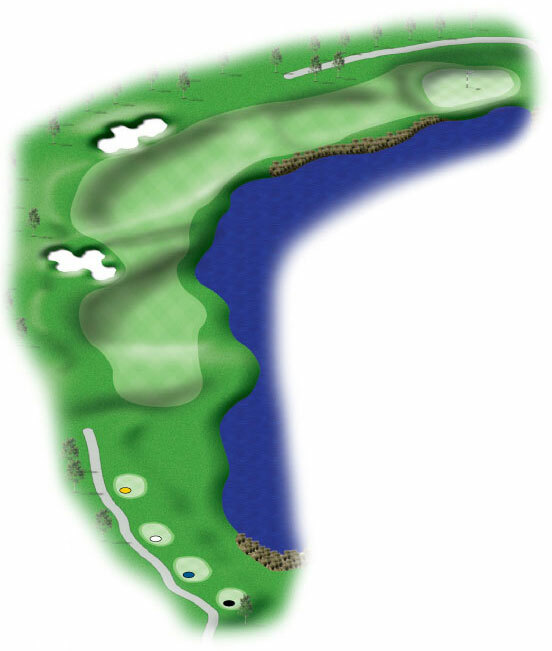 Choose the right-hand fairway and flirt with water as well as a tricky 50m carry across the gully to the green. This natural golf hole takes undulations from the adjacent dunes. 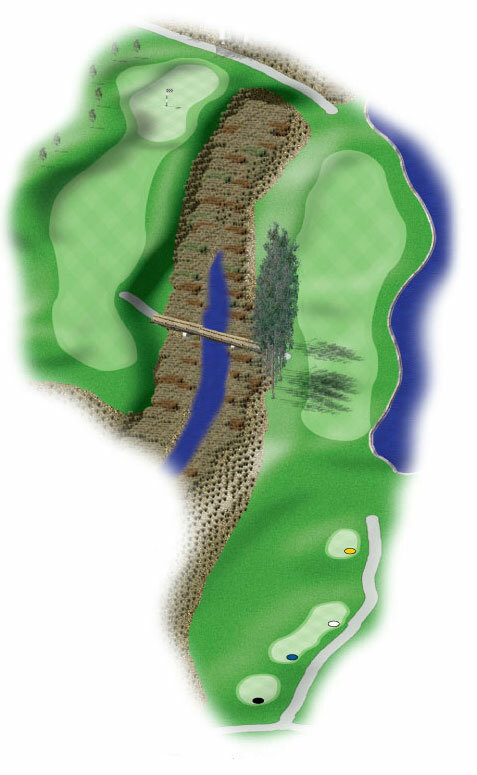 Strong players will easily hit their second over the wetland area to reach the green in two. Less confident players may lay up for a wedge into the green. Tees are nestled in the wetland creating a forced carry to the fairway. While the wetland along the right side of the fairway could look menacing, the fairway is generous and the green accommodating, ensuring a fun build-up to the finishing hole. 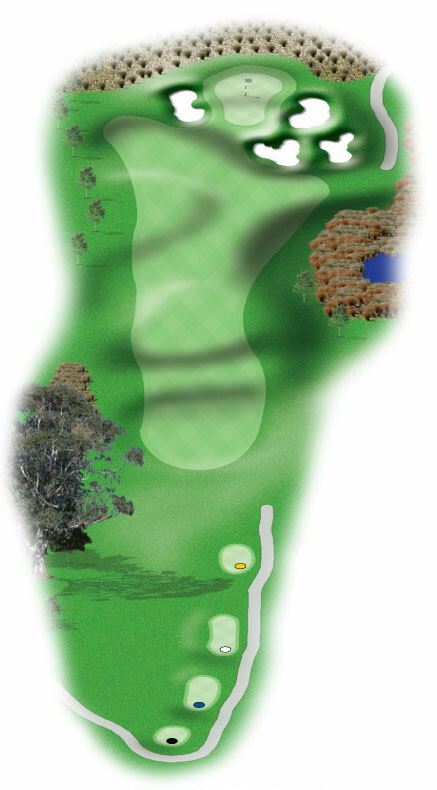 Take up the challenge and tee off the ‘town look out' tee box placed 45m behind the black tee. A challenging par 5 to finish the round. Water runs the entire length of the hole on the left and a bunker lurking in the middle of the fairway requires a good drive from the tee. A crowned fairway calls for accurate ball placement to avoid tricky recovery shots from the rough. The lake wraps around the rolling 18th green providing a beautiful backdrop.